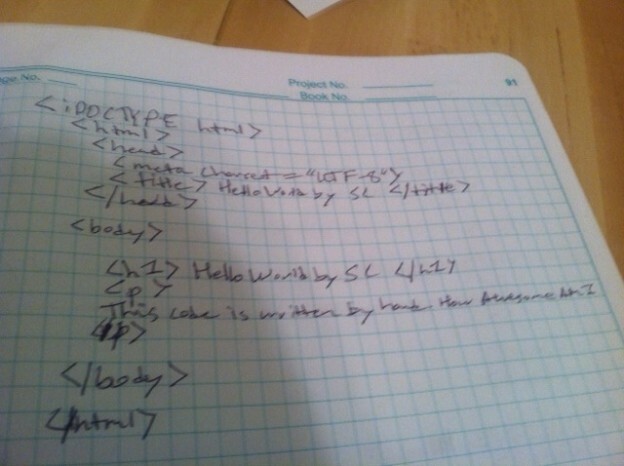 I did the html hand writing challange over a 30 minute period. I wrote out the html 5 times before I got it perfectly on the sixth try. The html handwriting task was important because it forced you to understand the proper order of the different tags and how they fit together. 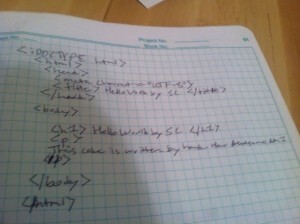 In the end this was a very useful task and helped me understand the layout of html. This code is written by hand. How awesome am I. 1) Independence – I am a CEO of a startup that utilizes the web and blogs for every part of my business. I feel that for me to truly move forwards in my role I need to have a true handle on all aspects of my business and that includes understanding what I’m asking others to do. 2) Creativity – I think it will be really cool when I can take the ideas I have in my head and learn to implement them myself or with a team. 3) Expansion – I want to expand my intellectual horizons, with the changes going on in this world and the continuing emergence of machines – I want to be able to interact with the future and not be left behind by it. This entry was posted in P2PU on February 12, 2014 by admin.